Smithfield Foods, which bills itself as the “world’s largest pork processor and hog producer,” detailed the plans in an announcement Thursday to expand its Smithfield Renewables initiative. The company strives to cut its greenhouse gas emissions 25 percent by 2025 — an aim set along with the Environmental Defense Fund that encompasses its “ambitious goal” to outfit hog finishing facilities with “manure-to-energy” projects. Starting in August 2016, St. Louis-based Roeslein Alternative Energy began distributing methane from pig manure into a national pipeline system at Ruckman Farm, near Albany, Mo. Within the next decade, Smithfield looks to have the natural gas recovery systems implemented on 90 percent of its operations in North Carolina and Utah, and on nearly all of its Missouri farms. 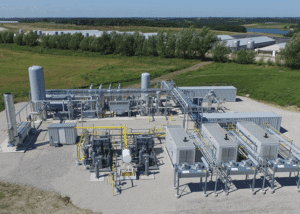 “In ten years, nearly 100 percent of Smithfield’s company-owned hog finishing spaces in Missouri will have the capabilities to produce (renewable natural gas),” the company said in a statement. The St. Louis-based company, Roeslein Alternative Energy, has spearheaded that work in Missouri, equipping hog waste lagoons — which can be acres in size — with covering systems that trap methane, a greenhouse gas with more than 20 times the potency of carbon dioxide. The captured gas is then cleaned and ultimately fed into a pipeline system that distributes natural gas nationally. The company completed the first of its “biogas” projects for Smithfield in 2016 near Albany, Mo., and currently converts manure from its farms into enough energy to power 15,400 homes.